EENHANA, Namibia — Waistbeads date back to ancient Egypt, where painting of dancers wearing the beads appear on tombs walls, according to a former educationist, historian and now a pensioner here in Ohangwena region. The tradition has since spread through several continents and centuries to include women in various cultures, including Namibia. According to Meme Paulina Omaholo, this cultural practice is also in the United States of America. Waistbeads have a number of different purposes and perhaps even more different styles. She says waistbeads can be very simple or incredibly elaborate. Beads can be of any size and material, including glass stone, clay and sandalwood or other material. Some African women add fragrant oil to their beads, Omaholo notes, while mostly the Namibian Oshiwambo women add gems and crystal to add healing properties. Most Oshiwambo cultures wear at least two or more strands of waist beads, although an even number of strands brings bad luck in some other cultures in Namibian regions such as the Damara/Nama, Silozi and Tswana tribes. African women have traditionally worn waistbeads beneath their clothing, yet other cultures proudly display the beads over their clothes or on bare midriffs. Waistbeads can serve as a symbol of femininity. The beads were an integral part of all African women initiation lodges and ceremonies in the old dynasties, according to the Oshiwambo tradition and culture. Young females began to wearbeads when they started to menstruate, marking their passage from girlhood to womanhood. “The beads may have also served as a kind of belt onto which the ‘monthly cloth’ was attached,” Omaholo adds. In other areas, waistbeads are gifts to young women about to marry, according to Omaholo. “Women of other regions in Africa wear the beads while pregnant or use the beads in foreplay to entice their husbands as in the Zambezi region here in Namibia and as well as in Malawi, Zambia and other parts of Angola and Zimbabwe. Others start to wear the beads as young girls after receiving a set as a baby gift. African folklore gives waist beads special powers, Lungowe Simataa from the Zambezi region says. The beads, worn to define the waist, help hold their shape. They also serve to help women hold onto their mate. Protection is another function of the beads, as they encircle the body and close off the circuits of energy. “Wearers are thus protected from obsessive thoughts, negative spirits and even vampires,” Simataa adds. Ornamentation is a major role for waistbeads. In the Zambezi region and other cultures in West Africa, the beads served to transform women into “walking charms,” she says. “Since beads were considered money all over Africa, waistbeads were both ornamentation as well as dowry in matriarchal societies. A husband-to-be would give his bride to be a set of waistbeads accompanied by beads for her neck, arms, wrists and ankles. Throughout parts of the world, Simataa notes, waist beads were worn for aesthetics, largely considered an item of beauty. Waistbeads have a long history in Africa and they have also filtered into other cultures. Belly dancers in Far Eastern cultures have embraced the beads as have women of Islamic cultures. 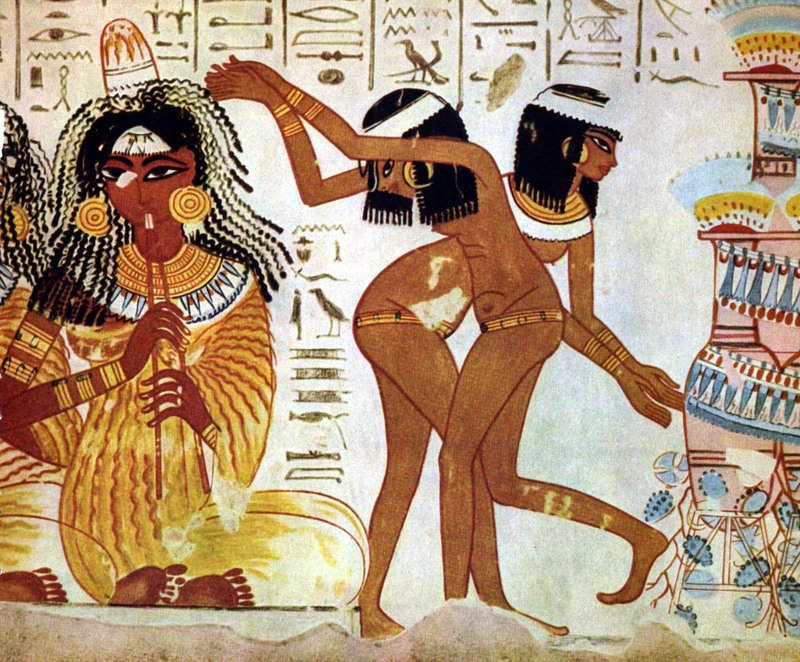 They prominently display the beads during their dances, while some wear them beneath their clothes. Hi, i love your thoughts on waist beads and working with Queen Afua. I was wondering why you keep refering to Egypt as seperate from Africa, saying, it stretched to different continents to Namibia? Its also another post on waist beads, that says from Africa to Egypt? Also saying you adorn them with African and Egyptian charms? Ancient Kemet = modern Egypt=Africa. Hi Carshena: Thanks for visiting my blog and for your insightful comments. I re-published this article because it had a lot of good information about waistbeads. I see that the sentence you refer to could be interpreted as you indicated, but I interpreted it as meaning that the waistbeads tradition spread from Africa to other continents, such as Asia etc. In my other posts, when I mention Egyptian charms, I am specifically referring to ancient Egypt or Kemet – pyramids, ankhs, the eye of Horus etc., differentiating them from adinkras, for instance. As a student of Queen Afua I am well aware of that there is often a disconnect perpetuated in media between Egypt and Africa and in no way would I want to continue that misconception.